The oceanfront Alohahouse property sits spectacularly oceanfront on the pristine Puna Coast in the Hawaiian Paradise Park subdivision just south of Hilo on the Big Island of Hawaii. This 3 bedroom, 2 bath home offers the vacationer an up close and personal ocean experience! You can't get much closer to the ocean without being in it! It lulls you to sleep at night and the sunrises are so incredibly awesome - you will want to get up early even if you are on vacation! In the winter months, you can hear and see the whales that come in quite close because the ocean is deep in front of the property. This is a great spot to catch fish from the bluff and cook right on the barbecue! Decorated island style with rattan furnishings and overhead ceiling fans in all the rooms, the home stays very comfortable all year! Sometimes you might even need a sweatshirt in the winter months! This home is centrally located and it is just a short drive to Volcano National Park, the Kapoho tide pools, and Hilo International Airport. The location is superb for the traveler wanting to set up base for the ultimate Big Island adventure. The oceanfront lanai is the place you will probably want to hang out after your day trips! The kitchen is fully equipped with all your dining needs, all linens are provided, along with soap, and laundry detergent (you won't have time for that though!) There is also an outdoor shower to rinse off after surfing, swimming, snorkeling, or hiking the volcano. We provide a cooler for your day outings too! The one bedroom Sunrise Cottage also located on the Alohahouse property can be rented along with the Alohahouse if it is available. This cottage can sleep a maximum of 3 guests in one double bed and one twin bed. It is currently long term rented, so only the oceanfront "Dolphin Bay" home is available which can sleep a maximum of 6 guests. The Alohahouse is located in a quiet, coastal community, Hawaiian Paradise Park, on one of the loveliest bays in East Hawaii where you can walk for miles and see nothing but pristine coastline and lush forests. Here you will experience breathtaking sunrises, cascading rainbows, beautiful lava formations, dolphin and whale watching, all from the comfort of your Alohahouse. The closest towns are Keaau and Pahoa for groceries, gas, and restaurants. The Alohahouse will become your island home away from home for your Big Island traveling experience because there is nothing better than coming back to your oceanfront home after spending a day of exploring - whether it be hiking Volcano National Park, snorkeling at the Kapoho tide pools, surfing at Pohoiki, soaking at the Ahalanui Hot Pond, or visiting wonderful Hilo town! And don't forget the fabulous farmers markets at Makuu on Sunday, and in Hilo on Wednesday and Saturday. I have many repeat guests - they come back mostly because they say they have looked around and there is nowhere else they would rather be. 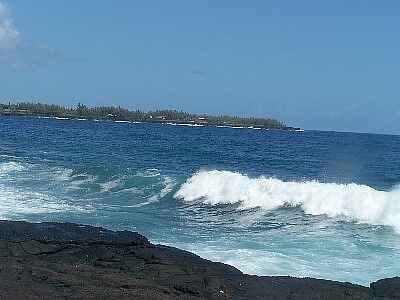 According to my guests, the home is comfortable and a great value for oceanfront Hawaii. The price is hard to beat for what you get!! It is a place for relaxation and rejuvenation! This is the Hawaii of old where you will not find tourist resorts, high rises, commercialism, or noise. Just the sounds of nature, the waves, the whales (in season), the birds, and the cooling trade winds whispering through the coconut palms and ironwood trees. Experience oceanfront Hawaii - you will be glad you did!